With cStar's TrakR™ solution, you can store, refrigerate and distribute restricted products in an automated, secure, paperless environment, while remotely monitoring inventory and collecting accurate statistics on product use and sales. And TrakR™'s fail-safe early alarms mean you can be confident that refrigeration units are functioning properly, storage temperatures are consistent and your products are secure at all times. 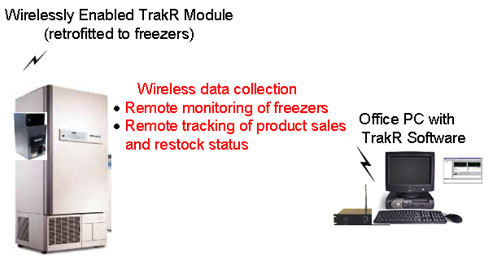 With TrakR™, you can remotely monitor and manage every detail of your inventory and respond quickly to sales activity and product storage conditions to eliminate product shortages and product expiration, significantly boosting both operation efficiency and customer service. And TrakR™ supports activity-based accounting, so you can track products to projects, researchers and grants and maintain comprehensive records of end-user access and product distribution. TrakR™ is available in three simple installation styles: front, side or top panel mounts.